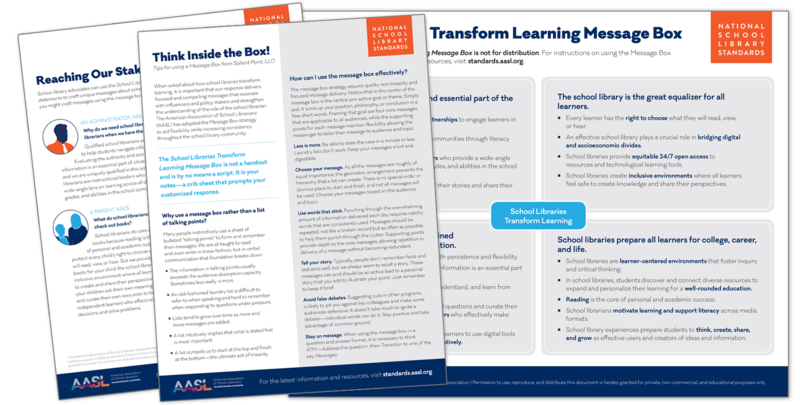 When asked about how school libraries transform learning, it is important that our response delivers focused and compelling messages that resonate with influencers and policy makers and strengthen the understanding of the role of the school librarian. The American Association of School Librarians (AASL) has adopted the Message Box strategy to aid flexibility while increasing consistency throughout the school library community. The School Libraries Transform Learning Message Box is not intended for distribution to stakeholders. The Message Box is not a handout and is by no means a script. It is your notes—a crib sheet that does not script but prompts you. Download the message box below, including tips and examples for using the Message Box Strategy.